We have plenty of writers on staff here in the lounge of thoughtballoons. I like to imagine that we each have a cubicle in one big studio apartment, there's a constantly percolating coffee machine next to the water cooler, and a random assortment of posters on walls and makeshift shelves (cats hanging from power lines right next to original Kirby pages), and as soon as you enter all you can see are the tops of heads angled down toward the Underwoods and you'll be serenaded by the clickety-clacking of the history of the future being written. Every once in a while a paper aeroplane might sail over, sometimes there's even a message in it. Everything is informal in here so, please, first name only. Ben was born from a young age. His hobbies include reading comics, writing comics and referring to himself in the third person. Ben is a self confessed coffee nerd, regular nerd and a Jock Nerd (personal jokes are the greatest). He spends his time writing for Squared Circle Comics, writing his OGN AlterNate, and making up excuses as to why he has not yet written a pitch for a limited series DARE! (which was originally published in the Beginnings Anthology). First name Michael, MK Stangeland, Jr. hails from the Midwest US. His career ambition is to make a living as a writer, and while he doesn't have plans to limit himself to the field of comics, it certainly provides a solid cornerstone for his “master plan” and is where is efforts are currently focused. He hasn't yet produced anything that's allowed him to write full time, but he has had a couple articles published by The Escapist web magazine, has at least one creator-owned comic project he's working on, and figures that with the number of ideas running around in his head, it’s only a matter of time before he produces something that gets his career off and running. That is, if he doesn't let procrastination and distractions stand in his way. Not becoming a regular comic book reader until right about the time Marvel was conducting its Civil War, he nonetheless maintained knowledge of the characters in his youth thanks to the various adaptations, including the Fox Kids Spider-Man cartoon, the early Marvel film projects; as well as his local library, bookmobile, and the wonders of the Internet. That plus the occasional Ninja Turtles and Street Sharks comics. He also happens to be an avid Star Wars fan. MK Stangeland Jr. doesn't twitter, but you can look him up on DeviantArt if you feel so inclined. In a way, comics have been part of Grant's life for as long as he can remember. From a young age, he was well-acquainted with their newspaper cousins, waking up early every morning to read them to his recently-roused parents. Years later, waking up early is a lot harder than it used to be, but his love for comics endures. It was while pursuing his post-secondary education that Grant first came across comics proper, falling in love with graphic storytelling all over again. This time around, Grant decided that the logical course of action would be to mix his love of comics with his love of writing. He's enjoying the results thus far. Ultimately, he would be thrilled to be able to make a living through his writings, whether comic-based or no. However, Grant is well-aware that such a path can be a long – and sometimes lonely – one, so he is eager to make the most of his time among the like-minded thoughtballoons crew. Should you (understandably) wish to read more things by this dashing young gentleman, you can do so over at his blog, The Thought Wrangler. Why comics? P.A. Nolte loves the collaboration. And the exploratory nature. And the rules. Which sounds stupid, but is totally true. If you're going to go exploring, it helps to know the constellations so you can orient yourself. If you're going to make comics, it helps to know the 180° rule so you can orient your readers. But, once you know what plants to leave alone, or how to use a page-turn effectively, there's no wrong way to go. And, if you're lucky, you get to do it with someone who shares that same passion for exploration as you do. Gone, but not forgotten....no matter how much we try, here are a few of those fantastic writers who have graced our pages over the years. If only I had kept all their bios. A comic fan since childhood because of older brothers, he used to tride the train an hour each way to visit the largest comic shop in the southern hemisphere. Now, he's spent years detailing his life as a writer on his blog, . Through heated fanlad discussion on Twitter, he got picked up by The Weekly Crisis to be a resident gonzo and he loves comics so much that he's even turned his hand at scripting a few from time to time; pitches to independent publishers have even seen him team up with fan favourite artist on Resurrection, Justin Greenwood. He now also writes weekly review for the comic web powerhouse, CBR, for which he, and his wallet, are eternally happy. He's written four novels, a multitude of short stories, sold a short film screenplay but his claim to fame when it comes shout time at the bar is always that he got an essay, 'Australian Noir', published in the back of Criminal by Brubaker & Phillips. He has a book coming out through SequArt (essays about Daredevil), a novel soon from a great little publisher, and he's putting together an exciting ongoing series at a very cool publisher. Dan hails from the UK, and his torrid love affair with comics began with two very opposing views of Spider-Man: a reprint of the gloriously technicolor Amazing Spider-Man #42 and the final issue of Kraven's Last Hunt (oh, the therapy bills). This schizophrenic start with the medium lead Dan to become a regular contributor to the sci-fi anthology Futurequake. He has also collaborated on 'Iron Harvest' with Rick Ross (Images 'Urban Monsters') and had work featured in anthologies from Ape Entertainment and Digital Webbing. Future work includes anthologies from Accent UK, Viper Comics and Once Upon A Time Machine. One day Dan will actually write something longer than 5 pages. People kept telling Rol that one day he’d make the big time. One day. So he slaved away for years writing novels, plays, short stories, TV scripts and comic books… Sadly, due to a lack of breaks, zero self-confidence, and the inability to talk hyperbolic bullpoop like Mark Millar, he died alone and unheard of, morose and destitute. You can take notice on his website, or his blog. Shaun was born, a baby, like most. He grew up in a small village in the U.K and went on to read The Hobbit, play tabletop fantasy games and see the greatest movie of all time, Die Hard. Through these wondrous events he grew into the man he needed to be. The one who spends his Saturday nights at home drinking Pepsi, (other fizzy pop brands are available) whilst writing comics he one-day hopes someone will actually draw into a nice pretty comic book. Until then he will just keep on writing. Shaun can be found on the Internet at his blog. Brian is an Irish writer and short film maker from the Viking-settled city of Limerick, but currently lives in Swansea, Wales. He has worked in the Newspaper Print and IT industries, and now works as a Trainee Lecturer in Film. He loves comics and recommends Tekkon Kinkreet to everyone. Brian is not a Viking but wouldn't mind a go off one of their boats. Niel Jacoby is an aspiring writer from the midwest US, and might well be the youngest tenured writer on the site. He has read comics for what seems like a good long while to him. He has read about comics for less of a while, which doesn't make that while any less good in his opinion. He does not particularly like talking about himself. He writes a set of monthly columns for Nerdcenaries.com, and personally blogs at nieljacoby.wordpress.com. You can find him on twitter, tumblr, instagram, and Draw Something as NielJacoby. He's probably forgetting things, but eh, that's life. Arby Moay is an aspiring comic book writer and novelist from the Philippines who dreams of one day going into outerspace because it seems like it could be fun. Having recently graduated from university, he is still currently looking for a good computer job, and is being very picky about it. He's been a lifelong fan of Batman and Robin, growing up in the 90's along with the animated series, watching it when nobody's around because the 'rents and nanny banned him of doing so (they think the show's too dark and violent). However, his relationship with actual comic books has only been for a little over a year, taking interest when he found out that his favorite novelist at the time, Neil Gaiman, wrote a Batman comic. About Bruce's funeral. Arby's been broke ever since. You can find him on https://twitter.com/aeglyss15, and on http://aeglyss.tumblr.com. He also has a webcomic called Sims University (currently in limbo) which uses the PC game Sims 3 as art, because he doesn't know anyone who isn't too busy to draw for him. Travis M. Holyfield is very friendly. He has written for the Marvel Heroic Roleplaying Game (Margaret Weiss Productions), and has contributed stories to numerous volumes of GrayHaven Comics' "The Gathering" anthology series. His latest comic, "Dober-Man" is currently available on ComiXology. He knows many funny jokes and stories, and he is a good kisser. Born from a mix of chemicals and lightning somewhere in the darkest depths of Scotland, J.D. "John" Coughlan has been a comic book reader for as long as he can remember. It was Batman, however, that got him into superheroes; a love affair that remains to this day. There was a brief falling-out in his early teens, but it was the TV show Smallville that got John reading comics again, no matter what he tells you. Around the same time, he was discovering his passion for writing. Honestly, he actually sweats as he types. 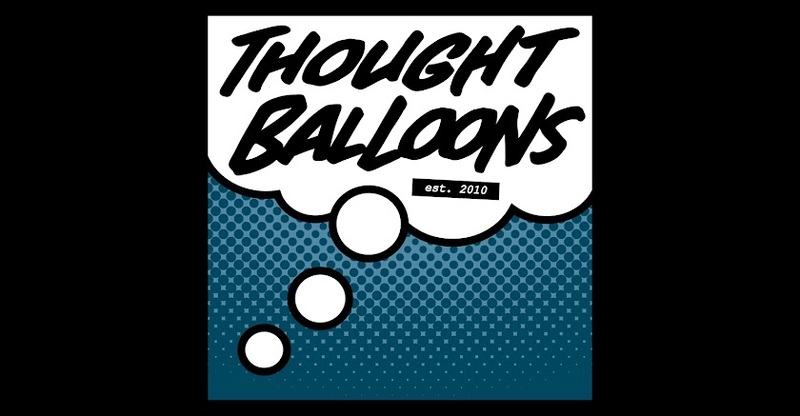 Still a dedicated trade-waiter, John occasionally writes short stories, screenplays, and comic scripts, but until a dying alien bestows him with a lucky break, you can find him writing for Thought Balloons. Derek Adnams remembered that he liked to write comics in 2012. Since then, his short stories have appeared in anthologies by Pross Comics, Indie Comics Magazine, Stache Publishing, GrayHaven Comics and Outré Press. He won the uCreate Comics 2013 Script Competition, which led to the publication of his 24-page one-shot SUITZ: Riot Act and he co-wrote Average Jo #1 for Hound Comics. 2015 promises to be his best year yet as a published writer, with over 70 pages of anthology work set to be released by publishers including Charlton, FutureQuake Press, Fat Cat Funnies and Free Fall Press. R.A. Wonsowski (The American Zombie) is an Expat from the USA living with his family in Paraguay. He is a teacher of Literature and Economics at the St. Anne's School in Asunciòn. His love for travel, which he got from his parents, led him to Hong Kong, and then through a surreal odyssey across Latin America. His political party is "Pragmatic", is a recovering musician, and is a big fan of both "Cosmic" and "Street" Marvel and Kirby DC. He is not who he used to be; his old self buried, a different person rose from the grave, shambling across the world in search of...brains. If you feel like you want to earn tenure then start playing along in the comment threads. You don't need to write a script for every week, but stick around, give critiques, get a few scripts up in the comments and you may just get noticed.